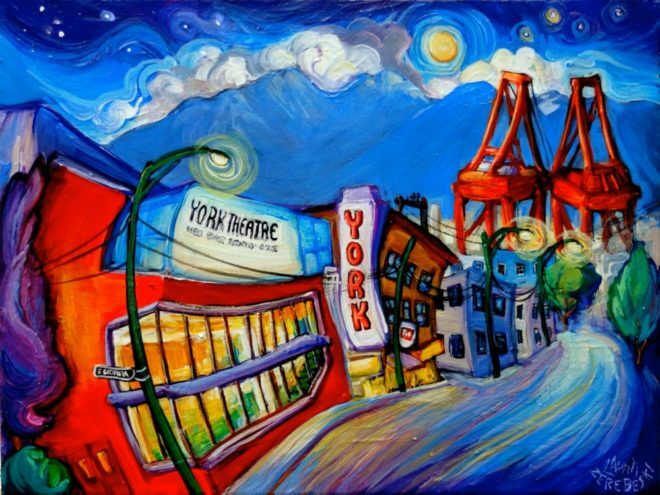 The York is a success story for vintage theatre lovers and everyone who despairs at all the disappearing cultural centers in Vancouver. Vancouver has lost a lot of historical cultural spaces: The Pantages, The Ridge, and pretty soon The Waldorf, just to name a few. Theatre spaces seem to be the most vulnerable. I have an ongoing series of destroyed cultural hubs that I call my “Ghost Town” series. They all have red stretcher bars; I’m glad to not paint red stretcher bars on this one. This century-old theatre had a lot of lives and names: The Alcazar, The Palace, The Little Theatre, The New York , and The Raja. It was saved from being torn down in 2011, lovingly restored, and reopened in 2013 as one of the Cultch’s rentable venues. It has a fly tower (so you can have scenery fly in and out), a proscenium stage, a red velvet curtain, and a gorgeous rainbow tile mosaic in the lobby. The York is also where my favorite theatre production happens: Theatre Replacement’s annual Christmas Panto. So there are lots of bright lights, bold colors, built-in happy faces, and of course the huge stevedore cranes. The cranes are always a motif for hard work in my paintings and especially appropriate in this scene.